Last Saturday, we had our 32nd Hill Country Antique Tractor & Machinery Show on the Gillespie County Fairgrounds here in Fredericksburg/TX. As I’m really interested in old machinery, I went there to take some fotos with the new Nikon D500, plus some videos – not with the Nikon though, even if that camera can shoot videos in 4K, but with a small JVC video camera. Well, those “some” fotos turned out to be 183, and those “some” videos in the end amounted to 17. That put paid to my intention to soon – hopefully the day after the show – publish something here on my blog. It simply takes too long to look at all those pictures and give those I want to show here a work-over. Well, I wouldn’t have wanted to publish all of them anyway, but even so I still decided to do more than just one post. It would have become way too long otherwise. So this is posting no. 1. Am vergangenen Samstag hatten wir hier in Fredericksburg/Texas auf den Gillespie County Festwiesen unsere 32. 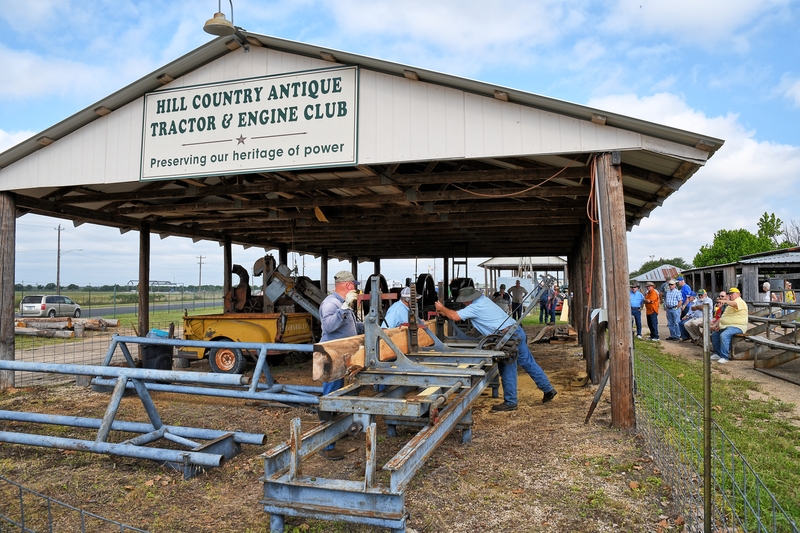 “Hill Country Antique Tractor & Machinery Show“. Für solche alten Maschinen interessiere ich mich sehr. Also bin ich hingegangen, auch um mit der neuen Nikon D500 ein paar Fotos zu machen und ein paar Videos zu drehen – nicht mit der Nikon allerdings, obwohl die das kann, sogar in 4K, sondern mit einer kleinen JVC Videokamera. Na ja, diese “ein paar” Fotos wurden dann am Ende zu ganzen 183, und die “ein paar” Videos immerhin zu 17. Und damit konnte ich meine ursprünglichen Plan, noch am Sonntag einen Blogartikel dazu zu veröffentlichen, ad acta legen. Es dauert einfach zu lange, alle diese Fotos zu sichten und die, die ich hier zeigen will, zu überarbeiten. Na ja, ich hätte sie wohl auch gar nicht alle in einem einzigen Blogartikel veröffentlichen wollen/öennen. Der wäre dann viel zu umfangreich geworden. Also mache ich mehr als einen daraus. Hier nun Bericht Nummer 1. Here, now, is the engine that drives the sawmill. It’s a 1925 Fairbanks Morse Type Y Diesel Engine, delivering 75 horsepower at a maximum of 300 rpm. It not only powers the belt drive(s), but also generator with a maximum output of 60 KVA 3-phase 60-cycle 2300 volts. Und hier ist nun die Maschine, die die Säge antreibt. Es ist ein Fairbanks Morse Typ Y Dieselmotor, der bei einer Maximaldrehzahl von 300 U/Min. 75 PS liefert. Dieser Motor treibt nicht nur die Treibriemen an, sondern auch einen Generator, der seinerseits eine Maximalleistung von 60 KVA hat und einen [hoffentlich übersetze ich ier richtig] einen 3-Phasen 60 Hertz Wechselstrom von 2300 Volt liefert. And now let’s look at this machinery in action. It was quite an experience for me. Und nun sehen wir uns diese Maschinerie mal in Aktion an. Für mich war es ein echtes Erlebnis. At the end of this post, here’s a picture that shows better than those before, how the planing-machine is driven: quite some belts! Am Ende dieses Blogeintrags nun noch ein Bild, dass besser als die vorherigen zeigt, wie die Hobelmaschine angetrieben wurde: ein ganz schön langer Transmissionsriemen! 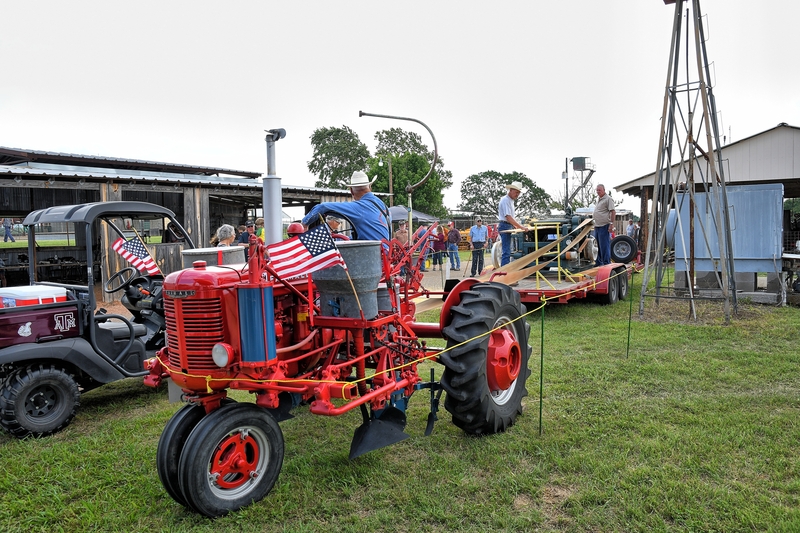 This entry was posted in (stationary) machinery, Antique Tractor Show, events, pictures, technology, tractors, videos, vintage and tagged antique tractors, Fairbanks Morse, stationary engines, vintage technology. Bookmark the permalink. If these are taken with your new camera, I’m impressed. I clicked to enlarge a photo and then clicked through them all in large size. Great clarity and colour. Nice job. Yes, Anneli, they were all taken with the new camera and the new lens. But I must admit that I worked them over some with EasyHDR so that they show more detail especially in the shadows. The programme may also have intensified the colours. It certainly brightened them. It may also have sharpened the contrast a tad. But then, it can’t get out what is not in the picture from the beginning. I’m glad you took your time to click thorugh all the pictures and enlarged them even.Thanks for your interest. That’s no problem to work them over. When people developed b/w photos from negatives, they had the option of lightening or darkening the prints too. I think it’s quite fair to touch up the lighting or contrast. I agree with you that you can’t get what isn’t there in the beginning, so fair enough. I still say, good job. I don’t objet to working the pictures over, Anneli. Not at all. Like you said, in the olden times in the darkroom that was common practice. I used to do it myself. Oh, that was fun in the darkroom, when you could watch the picture emerging. That fun, of course, is missing with digital photography. But then, digital photography has so many advantages. I wouldn’t want to miss it. I can see that this new camera of yours is capturing a great deal of detail, and I’ve never seen exactly this type of gear, very interesting. Anything with gears, I love, even if I take longer than most to comprehend it’s operation. I saw a much simpler, cruder version of a belt-and-gear-driven farmer’s sawmill, that was horse-powered, and just operated a simple up-and-down saw blade, but I hadn’t seen this tractor setup in action before. It’s great to see all these gears and flywheels actually in motion. Watching the videos is fascinating, and also strikes me that every single piece of equipment looks capable of pulverizing the unwary! One of my g-g-grandfathers, in Pennsylvania, lost half a finger to a planing machine. He wrapped his hand in a handkerchief, and walked home to have it sewed up. The woodshop where he was employed, stopped the clock when it happened, so he lost half a finger, and half a day’s pay – one of the joys of good old fashioned capitalism. I’m so glad you’re preserving this “on tape,” not sure how long there will be people around, who know how to operate these machines! Good morning, Robert! I thoroughly enjoyed seeing all that machinery, especially when it was working. I agree with you: that machinery could hurt people. I was thinking that, e.g. when I saw people standing close to the belt drives, and even more so when they were close to that rotating saw blade. Thanks for the story about your g-g-grandfather. Not the best of times then for workers, weren’t they? As to people knowing how to operate this machinery: we seem to have quite a few here in Fredericksburg, in that Antique Tractor Club. And it looked to me like they have younger ones in their, too. What a cool event! I’m like you around old trains. Machines and trains photograph so well. Looks like you’re really enjoying the new camera. Bravo! I really enjoyed myself there. And I must have very lucky with my timing, as I said. I saw (nearly) all of their machinery working. Except for the static displays, of course. You can follow the links at the bottom of that page for more pics, or click on any of the categories or tags under the picture. Thanks for the link. All my train shots are in B&W since they were mostly taken while I was in college and needed an art class. Lots of views of brakes and tracks too. There is something very cool about a train. Wish more Americans could experience that rather than always getting into a car. I certainly agree about trains/cars nowadays. And flying should also be taken into the equation. It’s really unfortunate how the US let a once great railroad system deteriorate. As you might have seen, for some of those vintage railroad engines I prefer sepia. Sepia and B&W are incredible on shots with textures. Love that! I think John would have loved this show. I’d have been wondering if we had to look at everything in QUITE such detail. Or I would have been looking for the tea tent. Beer tent even better! I love this old equipment. I had a farm in my youth and it supplied 100% of everything we ate including dairy products. I love seeing this, too, Yes, the good old days when so many people were self-sufficient. But not always an easy life. Working full time made it tougher. Das faellt fuer mich wirklich unter den Begriff “heavy machinery”. Wirklich sehenswert, vor Allem “in action”. Great photos with your camera, Pit! The focus and clarity are impressive. It’s a show of machine power and man power, very educational for me. Thanks, Amy, for that comment. 🙂 As to the focus: I think I managed (fairly) well here, although I had to learn quite a bit about how this camera focuses. Talkinng of clarity: I’ve planned – and I will soon do that – on a comparison of my different lenses as to clarity and sharpness. More of this series will appear here soon. And other events here. Soon I’ll be off to Luckenbach for the “Bach at Luckenbach” concert this afternoon. Hopefully I’ll get pictures and videos there. And then, for the weekend, starting tomorrow, we have a Native American event here in town, honouring the treaty between the Comanches and the white settlers, engineered by Otto Meusebach. let’s see what I can capture during the weekend with that Native American event here. Yesterady I was at that “Bach at Luckenbach” concert and enjoyed myself a lot. Before posting the pictures, though, I think I have to try and get permission, as some of them have close-ups of minors. Very cool! We get to see a lot of old machinery up here at local fairs and the state fair. I look forward to seeing more! I like that vintage machinery, too. 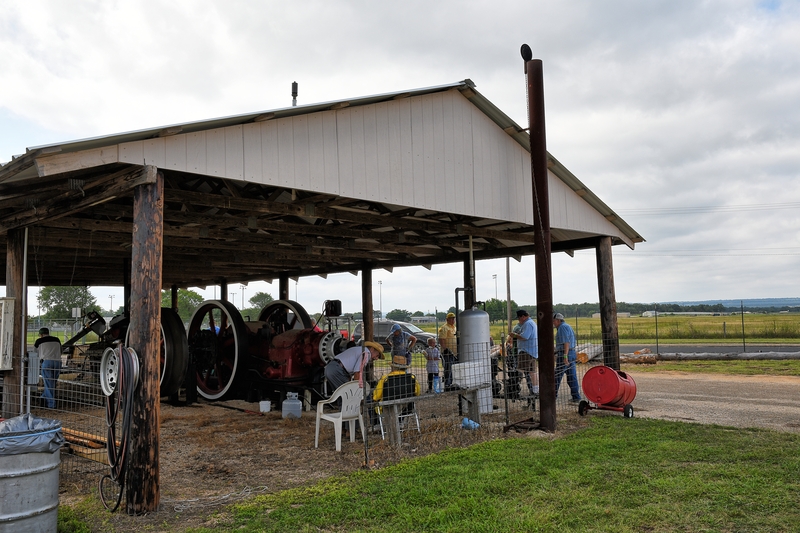 And there will be the Gillespie County Fair, too, which has some of this machinery. Plus the parade then and on July 4th. So you’ll certainly see more here on this blog. It’ll take some time, though, especially as there are events going on all weekend which I want to chronicle in my fotos. WOW, this is truly after the engineer’s (Alex’s) heart! And such beautiful shots with your new camera 🙂 🙂 Do you find that it takes self-discipline to shoot less, so you have fewer decisions to make later? I’m glad you liked the pictures and the videos. I totally enjoyed myself strolling around the fairgrounds and watching all theat equipment (in action). And thanks for the compliments. As to your question: yes, it does take a lot of self-discipline. Which, btw, I don’t have at all. Besides, I believe in taking plenty of pictures hoping that I find a few in them that are really good. That’s my “poor photographer’s” approach. 😉 I really need to develop a photograher’s eye for the angle, detail etc. P.S. : I’m happy you commented here so I can let you know that I can’t – for whichever reason – leave any comment at all on your blog. I have that problem with some other blogs, too. Soem of my comments end up in the spam folders, and some disappear into the electronic nirvana alltogether. It’s frustrating. I just wanted to let you know that, even if I don’t comment, I’m still following and enjoying your blog. Well, maybe you have seen that since my “likes” still seem to get through. I really enjoyed seeing those planers and sawmills. There’s a furniture maker over in Mountain Home that we took some felled trees to — mostly cherry. We had it planed, and then let it sit for a couple of years. When it was cured, he made a chest of drawers and some other things out of it. His name is Dean Storey, and he’s still quite active. You can see some of his work here. He’s always a part of the yearly woodworkers’ show in Kerrville, and his furniture is just fabulous. It was such fun to haul the trees over there, and eventually end up with truly hand-made furniture. I have two cutting boards another friend made from some of the excess: strips of cherry, black walnut, oak, pecan, and mesquite, joined together. The tractors are great, but I would have been hanging around the woodworkers! Thanks for the tip re Dan Storey and the woodworkers’ show in Kerrville. We haven’t been there yet. We go to the Mesquite Wood Show here in Fredericksburg, if we are here at that time. We had our dining-room table and the chairs made to order, too. Not from wood we had felled, though, and by 2 different people. But both of them were kind of artists (with wood). P.S. : Like I said above, I’m happy you commented here so I can let you know that I can’t – for whichever reason – leave any comment at all on your blog. I have that problem with some other blogs, too. Soem of my comments end up in the spam folders, and some disappear into the electronic nirvana alltogether. It’s frustrating. I just wanted to let you know that, even if I don’t comment, I’m still following and enjoying your blog. Well, maybe you have seen that since my “likes” still seem to get through. In the last photo, I like the way the red stripes of the American flag harmonize with the red of the tractor. So very nice. I actually want to fix up my dad’s old Ford 8 in and join the group. I would love to do their rides too. I dont’ know if 8 in is the correct way to write it. We have only always spoken about it so I am not sure the correct way to write that. Maybe you should make an effort to fix that tractor. I don’t know about the “in”. I have no idea what that means.